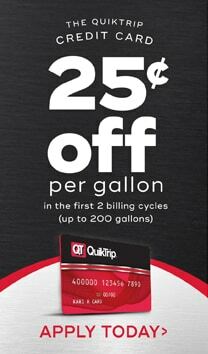 QuikTrip’s fuel management solution for business. This comprehensive program enables you to easily manage your company vehicles with emphasis on security, simplicity, and customizable reporting. Managers can set individual driver limits on all purchases and easily access transaction activity online, anytime. Plus, if you run into any problems with your account we are available 24/7. Conveniently and efficiently manage your fleet through Fleetmaster’s customizable reporting system and programmed driver limits. Each vehicle in your fleet is assigned a fleet card, and each driver a personal identification number. Odometer readings and driver ID numbers are collected each time fuel is purchased. Customizable reporting means you choose the type of information you receive. Extensive reporting provides employee name, purchase amount, and product type of each purchase. Exception reporting monitors nine different exception categories for fraudulent or excessive purchases that fall outside established operating parameters. Individual card controls can also be customized. Limits can be set to meet the fleet manager’s needs, including fuel only, total dollars per day, number of transactions per day, day of the week, and even time of day authorizations. Perhaps the best feature of the basic Fleetmaster program is the price – it’s free. Plus, you have the option to revolve your credit and you'll have 24/7 access to your account online, enabling you to make changes, review recent activity, and even make a payment. Need more extensive coverage? QT offers our Fleetmaster Plus* universal card program accepted at over 90% of all retail fuel locations. Fleet managers enjoy all the benefits of the Fleetmaster program, plus the additional convenience of fueling outside QT market areas. Contact our Commercial Fuel department for more information, 844-213-9363 or fill out this form.